Over the past month the Prime Minister, President, and pro-airport lobby have been increasingly vocal and clear about their desire to evict the ZAD [Notre-Dame-Des-Landes] and begin work on the airport as soon as they can. The time frame of January-March is recurrent in their public declarations. These are threats, not inevitabilities. The anti-airport movement is strong and determined, but to avoid the hassle of an eviction attempt we need to show our force beforehand, locally and internationally, so the State understands that they’ll only fail again. 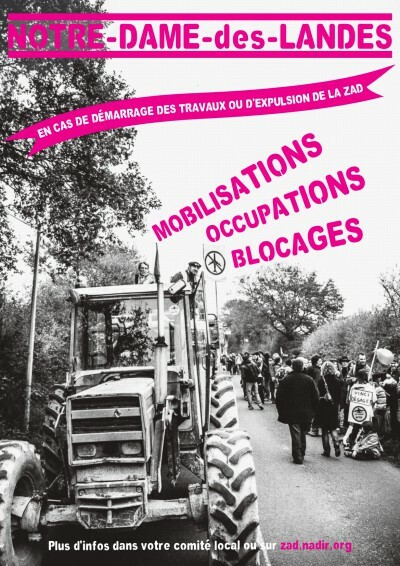 You’re invited to make actions, spread the word, have big demos, show up at French embassies/consulates and offices/worksites of Vinci (the airport contractor), in a dissuasive phase- and also to plan in different towns and organizing groups what to do from the outside in case an eviction attempt goes through. 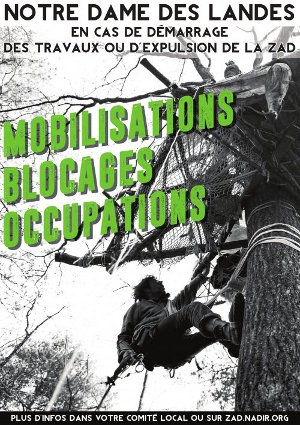 If you’ve been waiting for the right moment to do something to support the zad, make an info night, blockade a police station, send us lots of money, come visit and get to know the terrain, get into a public argument with a diplomat- now is the time! and also send us pictures at zad [at] riseup [dot] net. The government has declared they won’t wait for the end of the legal appeals process against the airport project. This means they are breaking the agreements they made in 2012 and 2014. They pretend that they want to come evict the zad to be able to begin work on the airport. This new police intervention could hypothetically begin early next year, in the weeks following the COP 21 in Paris, to make sure to be as hypocritical as possible. In the context of these threats, we call all the support committees and supporters to mobilize in the weeks to come to show the government that coming back and trying to destroy the zad is a very bad idea. To be prepared for whatever happens, we invite you to spread the word and to prepare for what to do if there is an attempt to evict or begin work. A series of flyers and posters have been printed for distribution. ZAD-NDDL – If they come back, we’ll resist even harder! – Disturb the check-points and movements of the police and ensure the circulation of supporters and supplies. – Nighttime noise demos outside the hotels where the police and military police sleep. – The first evening, meeting point of different actions or blockades, in front of the police headquarters at 6pm. – Demo Saturday in Nantes after one week of intervention. -Callout to occupy places of power or local operations to slow the flow of capital, as well as coming to the ZAD to defend for those who can. More information and updates can be found at zad.nadir.org. The airport will not be built – The ZAD of Notre Dame des Landes will continue to blossom!